Arundhati Roy's new book, Capitalism: A Ghost Story, reveals the contours of power in India today. Indian Prime Minister Narendra Modi recently inaugurated a new hospital and medical research center in Mumbai, one of numerous state-of-the-art private facilities providing world-class medical care to Indians who can afford it. This one, run by one of India’s largest corporate conglomerates, Reliance Industries Limited, will keep some free and some subsidized beds for the “underprivileged,” whose well-being is rhetorically invoked during such privateering initiatives, even as India’s public services themselves are famously underfunded and increasingly vitiated. During his speech, Mr. Modi, who comes from a majoritarian Hindu nationalist milieu known as the “Sangh Parivar” that identifies “real India” with resurgent Hinduism, asserted that ancient Hindus had demonstrated “great strengths in space science” and that there was evidence for the existence of both genetics and plastic surgery in India, the latter evidenced by the Hindu god, Ganesha, who has an elephant’s head on a human body. The gathering, attended by a dazzling array of Bollywood stars, was hosted by Nita Ambani, the wife of India’s richest man, Mukesh Ambani, who owns vast swaths of the Indian media. Any politician who hopes to run this large nation must have Mr. Ambani—whose estranged brother Anil runs the other half of the multibillion-dollar petrochemical empire left by their father—onside. In her speech, Ms. Ambani paid due homage to worthy ideals such as the non-negotiability of good healthcare for all and praised Mr. Modi for his apparent devotion to this principle. The event was described admiringly by India journalists, but few reported the astonishing claims made for ancient Indians, never mind taking them on critically. 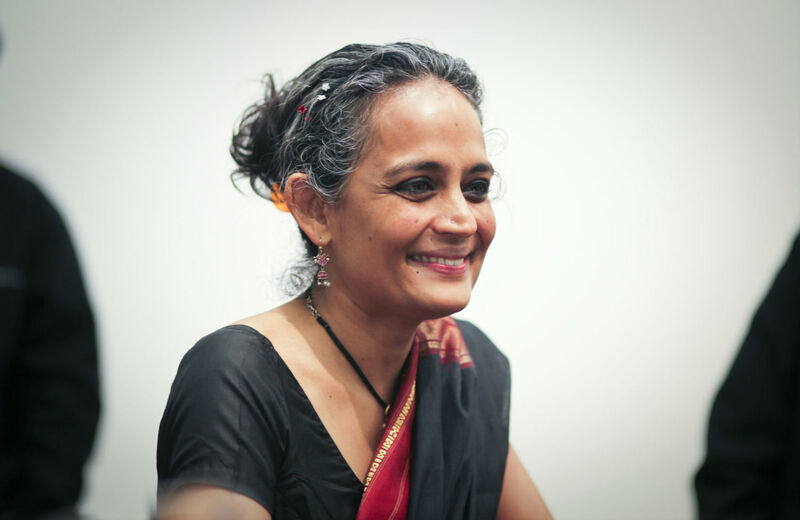 This cocktail of religious nationalism, buccaneering capitalism, a profoundly compromised corporate media and the soft power of philanthropy is the topic of the first half of Arundhati’s Roy collection of essays, Capitalism: a Ghost Story, a highly readable and characteristically trenchant mapping of early-twenty-first-century India’s impassioned love affair with money, technology, weaponry and the “privatization of everything,” and—because these must not be impeded no matter what—generous doses of state violence. After a short preface, the book opens with an image of “Antilla,” Mukesh Ambani’s billion-dollar family home, the “most expensive dwelling ever built,” rising into the sky like either a “temple to the new India or a warehouse for its ghosts” with twenty-seven floors, ballrooms, three helipads, six floors of parking and 600 servants. Yet it may not be inhabited, rumors suggest, because it fails to comply with ancient Hindu architectural codes known as vaastu-shastra, increasingly fashionable among India’s Hindu upper and middle-classes in an atmosphere of Hindu revivalism. It continues to fulfil its main function—announcing Ambani’s arrival into the billionaires club, while towering well over the city that also houses Asia’s largest slums, sweating, squatting and shitting at its feet. It is the monument that reminds us that corporations and the mega-rich call the shots in contemporary India. It is, however, corporate soft power that is the most compelling focus of the eponymous opening essay. The task of “Creating a Good Investment Climate” requires much more than soldiers and putting down insurgencies. It requires the Rockefeller, Ford and Gates foundations, the World Bank and the RAND Corporation. In deft brushstrokes that delineate both forest and trees, Roy paints a dense network of global corporate funding for apparently progressive enterprises. These corporate interests range from “good governance” initiatives to the much-lauded but often disastrous “microfinance” projects (“There’s a lot of money in poverty, and a few Nobel prizes too”) to literary festivals celebrating “free speech” and, perhaps most importantly, Non-Governmental Organizations, “global finance’s way of buying into resistance movements.” The last turns “potential revolutionaries” into nonconfrontational “salaried activists” with ideals of justice defanged by the language of human rights. Roy ends the essay, though, with a devout hope—that the resistance put up by some of the world’s poorest humans, not always unsuccessfully, will combine with capitalism’s crises to dig its grave. The cooptation of social justice and the notion of “public interest” is exemplified by a phenomenon that gripped India a few years ago, which is the topic of the book’s second essay. An “anti-corruption” movement led by a man called Anna Hazare with past ties to Hindu extremist groups demanded a “Jan Lokpal” or a powerful vigilance body headed by a commissar with draconian powers to monitor and punish corruption at all levels. It sounds unexceptional, even desirable, except, as Roy notes, it all depends on how we view “corruption.” Roy does not pose it in quite this way, but provokes us to think about whether a focus on “corruption” in fact exonerates the larger trends toward privatization for the systemic inequality plaguing India. What Roy does note is that despite the timing of the agitation, which included a highly showy fast-unto-death by Hazare, the proposed legislation would have exempted corporations and the media entirely, keeping the focus entirely on the government, which was being pushed to withdraw from its traditional duties to make way for privatization. The second half of the book focuses on Kashmir, an area largely ignored by the international community but on whose plight Roy has been a rare globally prominent voice. Patrolled by no less than half a million soldiers, the world’s most militarized zone belies the repeated protestations of the Indian state that it is not an occupying power. Kashmir, the government claims, is an “integral” part of the country. Tens of thousands of dead, tortured or “disappeared” Kashmiris constitute a large and bloodied blot on the face of the India. Yet truthful discussion of Kashmir is all but legally forbidden—Barsamian was deported around the time India was forced to admit the existence of 2700 unmarked graves in Kashmir, and other journalists have been prevented from entering the region. Last month two innocent young people, one 14 years old, were shot and killed by the Indian army as suspected “militants” when their car skidded to a stop after hitting an electric pole. Thanks to the scandalous Armed Forces Special Powers Act, which affords the Indian army legal immunity for deaths, rapes and disappearances in troubled regions, these “regrettable” actions are immune to civil prosecution, an unfathomable disgrace in a country that likes to preen over the appellation of “the world’s largest democracy.” As Amit Bamzai, a young Kashmiri friend of mine, notes, the usual rigmarole will now ensue: regret at collateral inevitable damage in a necessary war against terrorists and “separatists,” followed by an official inquiry, followed by a military court that will find insufficient evidence and produce an acquittal. But as Roy suggests in her essay, “A perfect day for democracy,” the state is perfectly capable of meting out punishment. She describes how the execution of Afzal Guru, a Kashmiri, was fast-tracked to appease “the usual cocktail of papal passions and a delicate grip on the facts” emanating from India’s famously overwrought television news programs and talk shows. Arrested and charged along with two others in the wake of an attack on the Indian parliament in 2001, Afzal Guru was a former or “surrendered” militant in Kashmir who now lived in Delhi. Roy writes of a “pile-up of lies and fabricated evidence” that was created by the police to implicate Guru, who was not among those who had attacked the Parliament. India’s Supreme Court itself noted contradictory and flawed evidence and set aside Guru’s apparent “confession” citing “lapses” and “violation of procedural safeguards.” Why hang him then? Because, it argued, the entire nation had been “shaken” and “the collective conscience of society will only be satisfied in capital punishment is awarded.” Both the condemned and his family were denied the right, enshrined in law, to challenge the president’s rejection of his mercy petition, and the body was buried within the jail compound, despite the family’s pleas for it to be returned to them for burial. This Baal-like “national conscience” that demands human sacrifice from time to time is not without its family connections to Mammon. The Kashmir essays are not explicitly tied to the spectral capitalism of the book’s title, but we are reminded that the bellicose grandstanding that followed the 2001 attack on the Parliament and the perpetuation of a warlike climate with neighboring Pakistan ensures military spending remains high enough to fatten several bank accounts. The last chapter of this collection is the text of a speech given by Roy to the Occupy campaigners at Zuccotti Park. While it allows the book to draw connections between the resistance movements Roy has invoked in her essays, its cheerleading tone tends to flatten the vast economic and social distinctions between indigenes facing down the Indian army and young people in the United States and elsewhere in the West radicalized by student debt and Wall Street scandals. We are all, indeed, fighting the same phenomenon, but on vastly different terms and with varied consequences; it remains unclear at this point in time whether the “Occupy Movement has joined thousands of other resistance movements all over the world in which the poorest of people are standing up and stopping the richest corporations in their tracks.” Connections are essential; eliding differences is not. Nonetheless, the inclusion of the speech allows the collection as a whole to suggest that the middle classes and the educated are capable of resistance. In other essays, Roy emerges as a lone insightful figure, understanding and translating the anger of the dispossessed, while other radicals, including the left and feminists, in India remain blinded to their own limitations. In fact, Roy herself emerges from a long and diverse line of dissenters and campaigners whose work is the silver lining on India’s otherwise bleak social and political landscape. They include, to mention but very few, the Dalit organizer of manual scavengers Bezwada Wilson, the leader of the Narmada Dam resistance campaign Medha Patkar, the filmmakers Anand Patwardhan and Rakesh Sharma, the assassinated radical theater personality Safdar Hashmi, the civil rights campaigner K. Balagopal, the rural rights and right-to-information campaigner Aruna Roy, the writer and tribal rights activist Mahasweta Devi, the Dalit rights activists and poets Namdeo Dhasal and Sheetal Sathe, the journalists Teesta Setalvad and P Sainath, and the assassinated mineworker trade unionist Shankar Guha Niyogi. To remember this is not to deny the stylistic uniqueness of Roy’s powerful oppositional voice but is, rather, to acknowledge that when it comes to opposition and dissent, as movements and as individuals, we are very much the many.